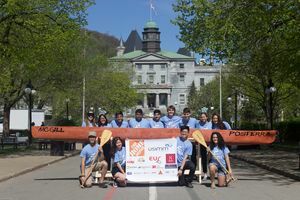 1 What Is a Concrete Canoe Team all about? 2 How do you get involved? What Is a Concrete Canoe Team all about? Design, Build & Race a winning concrete canoe…. no, there is no typo here, we make a canoe entirely out of concrete! It is easiest to reach us via our Facebook page. Send us a message! 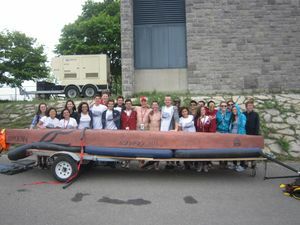 To see some photos and information about our previous canoes, click one of the tabs below. Results at competiton: 9th Place at CNCCC 2018. Our canoe Minerva at competition in May 2017. Results at competiton: 5th Place at CNCCC 2017. Posterra with our team before leaving for competition in May 2016. Results at competiton: 7th Place at CNCCC 2016. Our team in May 2015 at competition in Toronto. Results at competiton: 5th Place at CNCCC 2015. Anakalypse with our team at competition in 2014. Results at competiton: 4th Place at CNCCC 2014. Kraken with our team at competition in May 2013. Results at competiton: 7th Place at CNCCC 2013. 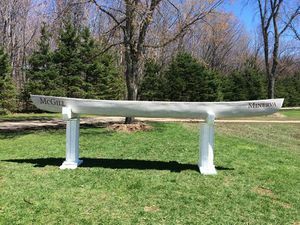 This was the founding year for McGill Concrete Canoe, and an impressive result for our first attempt. 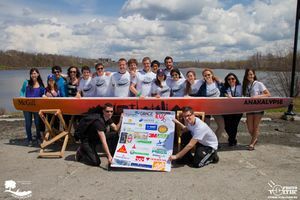 Every year in May our team joins Concrete Canoe teams from all over Canada for a serious engineering challenge: teams present the hard work they have done over the past year in hopes of winning at competition. The competition itself is judged based on several components: Aesthetics, Design paper and more help decide which team wins every year. Most importantly, an open-water race determines the fastest team! Students from over 15 Canadian universities share valuable experience and have tons of fun during a 3 day competition! Responsible for the design and optimization of the canoe hull. 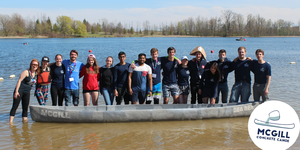 Each member designs their own hull using AutoCAD, Excel, and DelftShip and then, gets to 3D print their own canoe to complete physical testing. Physical tests such parameters as stability, maneuverability and speed. These results are utilized alongside Delftship modelling in order to select the final design. The final hull design is analyzed under various loading conditions with a combination of hand calculations and MATLAB programming. Main goal is to determine a lightweight concrete mix design that will meet: density, strength and aesthetic requirements while following competition Rules and Regulations. Research and testing are conducted alongside each other: new materials, their proportions as well as different curing techniques are developed and tested throughout the year in order to design a winning mix. Everyone on the sub-team gets to learn a lot of theory, various concrete design approaches and finally, get into the laboratory to perform all the mixing and testing procedures. Making a canoe made just out of concrete look as an eye-pleasing piece art is our job and it is not easy! Theme development, design of the canoe's interior and exterior aesthetic elements, final product display and a lot more tasks which involve both artistic and practical approach fall on the shoulders of aesthetics sub-team members. Turning structural drawings into reality is the mission of the construction sub-team. Design and construction of canoe molds, developing canoe casting techniques as well as an actual canoe casting, sanding and finishing the surfaces are just some of the tasks. On-water practice weekends and weekly indoor paddling practices with qualified coaches for all sub-team members. Good vibes and good workout are guaranteed! Marketing, social media, photography, finances and almost everything non-technical is done by the business team! An ultimate goal of academic sub-team activity is attaining a highest score for a technical paper. This includes wide range of activities: from overseeing activities of all sub-teams throughout the year and collecting all key information about the conducted research to the preparation of a technical paper and finally, giving a presentation during the competition. This page was last edited on 5 April 2019, at 14:45.